Use the box below to proofread your content (free) or skip to the list of our top 5 best free proofreading software online. A perfect example of a typo that can ruin your copy, right? Well, we all are guilty of making common grammar goofs that make us look dumb. Sometimes, faulty writing can cost us grades and even get that business proposal dumped! But doesn't proofreading and polishing your writing seem like an extra work? In this article, I'll share a list of my top 10 best proofreading software and tools that will check your writing for grammar and spelling errors, suggest you any missing punctuation and polish your writing for free! Importance of proofreading: Why is it important to proofread your content? It's important to proofread your content because error-free and flawless content is a must if you want to have clarity in your communication. Proofreading a document (can be an essay, an academic research paper, a business proposal, blog posts or a novel) is the final step that is a must before you consider it ready for submitting (or publishing). Leave alone your papers, 54% of employers will think twice before hiring you if you make spelling and grammar mistakes in your tweets or social media posts. No matter you're a student who has an academic essay to submit or a blogger whose article will be read by thousands, you need to proofread your content to comb out all possible grammar goofs. It is important to proofread your writing because no matter how carefully you write there is always room for correction. If you've checked for comma errors, there might be an apostrophe missing. If you've checked for every grammar mistake, your content might have some style inconsistencies. What is the main purpose of proofreading a paper? The main purpose of proofreading a paper is to make sure there is no grammatical or spelling mistakes in it. You also need to make sure that the content of the paper is jargon-free, conveys the right tone and has a consistent style of writing, throughout. Grammarly is one of the world's best proofreading tool you can find. 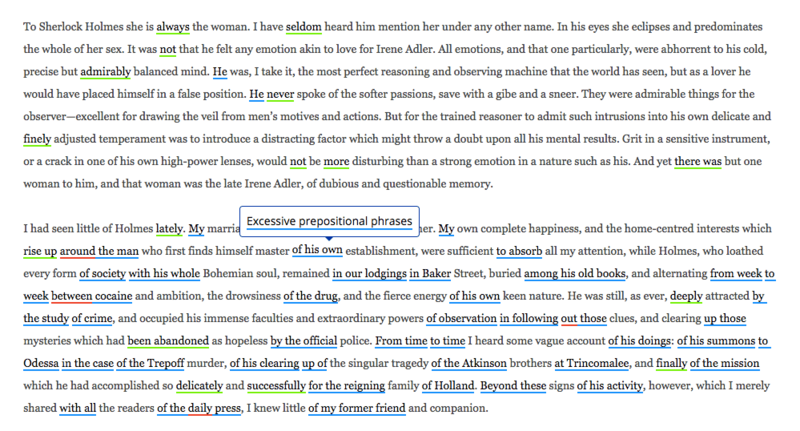 Grammarly is a free browser extension that acts as a fresh pair of eyes for you to detect not only grammatical and spelling mistakes but also helps you with sentence rephrasing, avoiding wordiness to name a few. Grammarly is an online proofreader tool, so you can use it across all any platform you write, may that be a blog post, social media updates or a business email, Grammarly proofreads all. Check out my hands on Grammarly review here. You can also use Grammarly's own writing editor online for free (click here to get a free Grammarly account) and then directly write on their inbuilt editor right from your browser. It detects over 400+ types of grammatical errors, contextual spelling mistakes (ones that your favorite word processor often skips) and helps you with the correct punctuation. If you already have written a paper or article, you can simply copy pate or upload the document and let Grammarly do the proofreading for you. If you want a robust proofreader software that detects and proofreads complex language mistakes like subject-verb agreement, active and passive voice checker or writing style. Grammarly's citation generator then generates citations in APA, MLA, and Chicago. Grammarly is free to use, but they do have a premium plan (Grammarly's professional proofreading) where they provide the plagiarism checker, and even have a human proofreading service if you prefer that. It's one of the best proofreading services out there. Grammarly is also available with business plans for teams (trusted by Cisco, Dell etc) and as Grammarly EDU (trusted by University of Phoenix, Illinois and leading libraries to name a few). If you're looking for free proofreading apps, Grammarly's Android and iOS apps have got you covered. WhiteSmoke's proofreading tool is yet another mistake free grammar and proofreading software on the block. WhiteSmoke's language tool comes as a package with bundled grammar checker tool, spell checker tool and punctuation checker tool that make it a proofreading software that's heard to beat. WhiteSmoke offers all the essay correction and writing suggestions based on natural language processing or NLP and according to context. It checks for your grammar mistakes, style errors and offers features like thesis checker to tense shift checker that make your proofreading with WhiteSmoke buttery. With its plagiarism checking feature, WhiteSmoke can be your best CopyScape alternative if need be. Furthermore, it offers integrations with MS word and outlook so if you're looking for proofreading tools in MS Word, WhiteSmoke is for you. If you're looking for the best website proofreading software, WhiteSmoke has got you covered. If you're looking for the best proofreading software for writers, it is this! I've covered ProWritingAid before in this blog. It's one of the best grammar and spell checker tools you can find online. Editing your content: (includes grammar and spell corrections, proofreading, punctuation checking, style suggestions and other advanced editing tools like tense shifter). Style checker, clichés, sentence structure, readability measures, repeated words, dialogue checker, pacing, checking your transition words, acronym and homonym checker are few of the features offered by ProWritingAid that makes it a perfect writing & editing tool for authors and editors. Checking for plagiarized content: Even though you don't copy, there might be traces of unintentional plagiarism (errors in proper citation, content influenced by something you read sometime ago etc) that could ruin the game for your paper. Make sure to check out my review of ProWritingAid to check out full features including 20 reports it provides after analyzing your content. ProWritingAid is the only proofreader software in this list that supports Google docs (along with other options like using it online, with MS Word, as a standalone app etc) which is a bonus if you do a lot of writing on Google docs (like me!). UPDATE: Grammarly now supports Google docs! If you're looking for a proofreading software for scrivener, PWA has got your back covered. ProWritingAid works for everyone looking for a easy to use yet accurate proofreading tool but it is the best editing and proofreading tool for authors, storytellers and potential writers. ProWritingAid's style checker detects such errors that are next to impossible for a human eye to check, may that be passive voice, use of adverbs or any other readability element like sticky sentences or maintaining a safe glue index. All of which make it a great Whitesmoke alternative writing tool. ProWritingAid, like Grammarly, can be used to preset a style based on what type of content you write; business, web, creative or any other. This gives a better scope for proofreading your document based on the industry you're writing. Or, use the code "GYD1925" to claim your exclusive ProWritingAid coupon with a whopping 25% OFF to save money. Ginger software is another popular free proofreading tool that checks your content for it's correctness and coherence. Ginger's online proofreading service does a great job checking your mistakes in the document you submit. It checks for a variety of errors (like misused words correction, consecutive nouns, phonetic spelling mistakes etc) and makes sure your content (may that be an essay, a research assignment or a CV for job application) is 100% error-free and flawless. You can also download Ginger's free proofreading software to your computer if you prefer a proofreader that reads out your document loud so that you can hear it and spot minute grammar mistakes to fix. Like Grammarly, Ginger also helps you learn throughout your correction process with tips about each mistake and how to avoid it the next time you write something. This is what makes Ginger a popular Whitesmoke alternative. Paper Rater is another incredible online proofreading tool which uses Linux-based OS with artificial intelligence to provide you the best results to eliminate all the punctuation and grammatical mistakes from your content. You can also use it as a plagiarism checker tool along with grammar and spelling check to hone your writing. Then you'll have to select an option where it says “Select the education level of this paper’s author” and click on "Get Report button" and it will proofread your content online and show you all the grammatical mistakes in your content. Although Paper Rater is a free online paper editor, it gives you a ton of other useful features like advanced plagiarism check, ad-free, faster processing text etc with its premium version that costs you $7.48/mo or $47.70/yr. There is no comparison of Paper rater with Grammarly. In fact they are the ones who promote Grammarly right on their website. Apart from that, Paper Rater doesn't offer as many features as Grammarly does nor is it efficient to catch as many grammar mistakes. I'll write a detailed review and my analysis on Paper rater vs Grammarly soon. From the initial look, it just feels just another mistake free grammar & proofreading service. PerfectIt by Intelligent Editing is a full-fledged and one of the best proofreading software for professionals. It is designed to be used by businesses, corporate clients, authors and writers. PerfectIt offers a plethora of proofreading services that save you a lot of money hiring a professional proofreader. One of the best features I like about Intelligent Editing is that it learns your preferences over time. This saves you time and keeps your style consistent across the document. 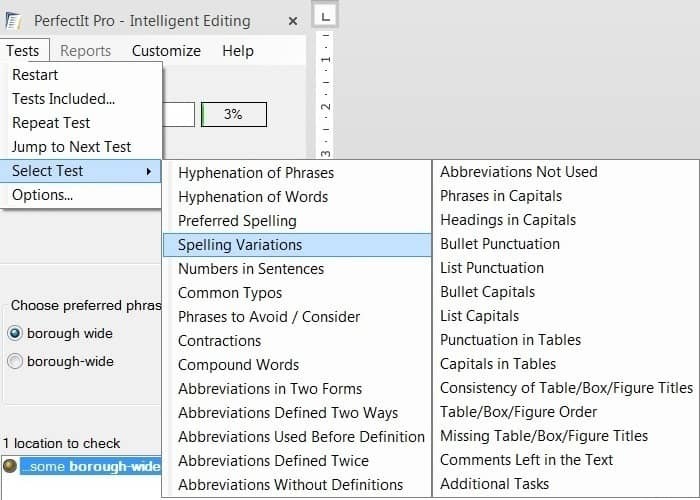 You can download Intelligent Editing's proofreading software to integrate it with MS Word that then runs a series of tests over your written document to check every single grammar or writing error (you can, however, skip to any particular test mode to proofread your document for that specific grammar rule). It does offer a free trial mode but you'll have to buy it to use it in it's full potential. Autocrit is one of the best online proofreading tools for book authors and editors that can save you from those grammar nazis and create an impression of error-free English. If you’re an author or editor who wants to improve your writing or manuscript, AutoCrit online editing software is made especially for you. It simplifies the revision process and helps you quickly become a prolific writer. You can simply consider AutoCrit as a online book editor or proofreading tool for manuscripts which helps you with editing and revision of your writing (especially helpful for authors who want to write high quality and flawless content). It checks your content for too many adverb usage, cliches, sameness in sentences and lot more. To use autocrit, either use their drag and drop text editor to copy paste all the content you want to proofread and improve (OR) you can also upload a file that contains the text you want to improve. Once you click on "Analyse the Text for Me" button, it will immediately start showing suggestions to improve your content along with the typos, grammatical mistakes in content etc. Once you’re done with uploading, it will ask you for your email address to send you a free summary report of your content. UPDATE: Autocrit now offers a free trial and the paid version with full access to it's manuscript editor costs you $29.97 per month. If you can’t afford to hire a prolific English writer who can proofread your content, essays or articles for grammar-free writing, Slick Writer is a handy free online proofreading tool for you. Check the image below to see Slick Write's free online proofreader in action. Correct English is an AI powered free online proofreading tool that doesn't require you to download a software. If you want a minimal proofreader that does a decent job, Correct English is one of those best proofreading sites I'd recommend you. As the name says, Correct English helps you correct English within your content by checking all the grammar, spelling, punctuation mistakes etc to improve your context. checks for communication clarity in your content. Polish my writing is one of the most popular free proofreading websites you can find. It just has an editor that let's you write or copy paste your prewritten document to proofread. It is an essay proofreader free for use and let's you correct simple grammar mistakes and providers style suggestions. If you're looking for a free online paper editor, Polish my writing aka after the deadline is something you might want to try. 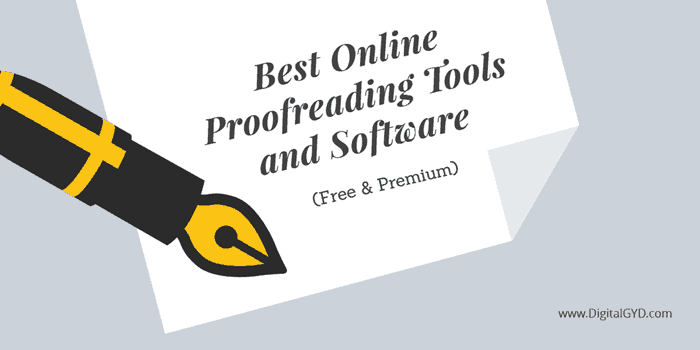 I hope you liked our list of top 10 best free online proofreading tools and software for 2019. If you want to stop spending countless hours on editing, proofreading and correcting grammar within your content, start using the online proofreading tools mentioned in this post. All of them are free to use and easy to access so you can quickly improve your essays, content, and articles. However, I along with 10+ million other people happily use Grammarly as our favorite proofreading tool and it never disappoints us. All these proofreading tools mentioned here do their job well but when it comes to choosing a winner, none beats Grammarly. Pro tip: You can earn money online by doing various online proofreading jobs. 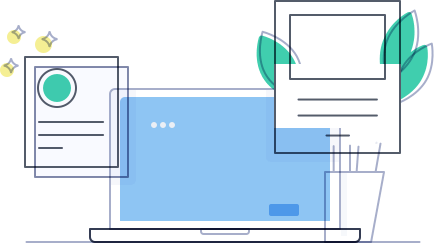 All you need is a tool like Grammarly that you can use to proofread your clients' document (and if something is more complex, you can use Grammarly's manual proofreading service without letting anyone know) and charge them a fees for that. You can provide your services on Fiverr too. You can try Grammarly free of cost using the button below or gift yourself the paid version by availing 20% discount on Grammarly or if you're a student, click here to get Grammarly student discount. Do you have any more free online proofreading tool recommendations? Comment below your favorite proofreading software! Grammarly helps you write flawless English and makes sure everything you type is clear, effective and mistake-free. Foodie Pro Theme Review 2019: Best Genesis Food Blog Theme Ever! Wow, I didn’t know there were so many free tools out there for proofreading. I know many people use Grammarly and it never lets them down. My business partner is my proofreader and editor so I have a built in human to help me, otherwise I would be using Grammarly myself. Nothing beats an human eye! You’ve the best proofreader in the world!